There is no more rewarding time at South River Lavender than the spring harvest. After carefully weeding and nurturing dull green, dormant shrubs through Winter, the vibrant display of color and sweet lavender aroma that begins to envelope the farm in April is an amazing transformation. Harvesting lavender at peak quality requires monitoring the flower buds as they begin to show color and partially open. As June farmers market opening dates loom closer, we keep a close eye on the early blooming English lavenders and anxiously await the arrival of the bees that signal the start of harvest season. The optimum time to harvest each variety is relatively short. Lavender intended for drying is cut when the entire flower spike achieves full color and only a few of the buds have opened. Open flowers turn brown when they dry, so a properly harvested lavender bundle will retain color and stay intact as it dries. 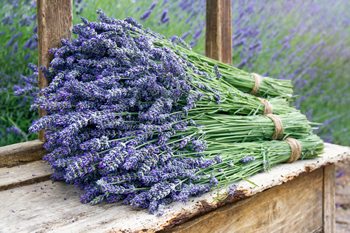 Our lavender is harvested by hand, bundled and banded as it is cut in the field. The work is usually done midmorning after the dew is gone, while the temperature is still relatively cool and the bee activity is at a minimum. (so many bees!). Age-old practices abound to maintain the quality of cut lavender when harvesting. One steadfast rule: never cut wet. Allow moisture from rain or morning dew to completely evaporate before harvesting to avoid the possibility of mold developing in the bundles. 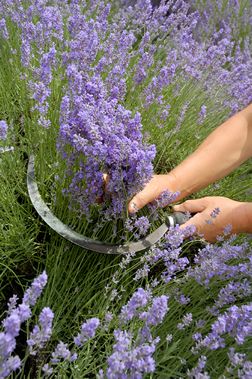 Never cut lavender when it is extremely hot to avoid stem wilt. We have a little more latitude when harvesting lavender for fresh bouquets. We allow more of the flowers to open and are not too concerned with moisture before bundling stems that go directly to market as a fresh-cut bouquet. It is a little counter intuitive to cut early in the bloom for drying lavender and later for fresh cut, but that seems to work the best. Throughout harvest season, lavender cut for drying is hung upside down in 2” diameter bundles from rafters in the barn about 9” apart. We keep a gentle air flow moving from oscillating fans to prevent mold from developing and keep the environment as cool and dark as possible to minimize color loss. The smaller bundle size also helps to prevent mold during the drying process. Elastic bands are used to keep the bundles tight and prevent them from falling apart and dropping to the floor as the lavender stems dry and shrink. (an unfortunate lesson learned with tied string). Fortunately, different varieties of lavender do not all bloom at the same time. We start our market season with fresh cut short stemmed English (true lavender) varieties and transition to long stemmed fresh cut Lavandins as the summer heat approaches. Long straight dried lavender bundles begin to replace our fresh cut market fare as August temperatures soar to 100 degrees. The popularity of our dried lavender bundles at the market in September is a testament to proper handling of lavender cut in July. The South River Lavender summer involves busy days harvesting and hand crafting lavender products for market. We hope to see you at the Amador County Farmers Markets this season to share the extraordinary essence of these remarkable plants.